If you are looking for The Ordinary products for general anti-aging needs, please refer to this post. 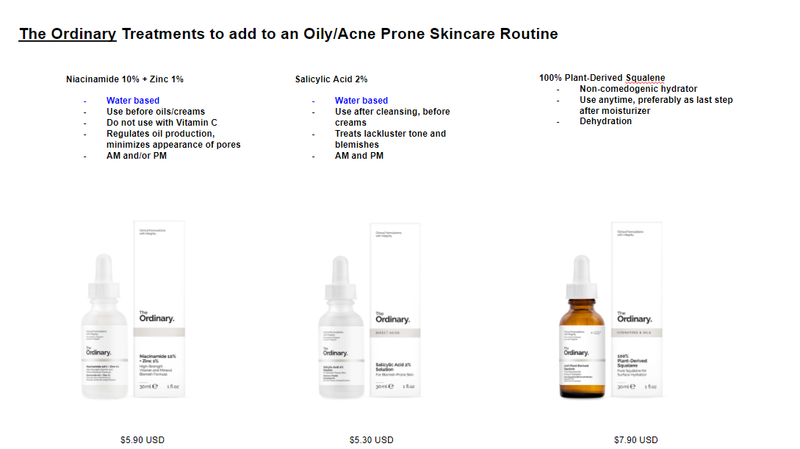 If you’ve landed on this post, that means you’re probably looking for The Ordinary products for oily, acne prone skin. 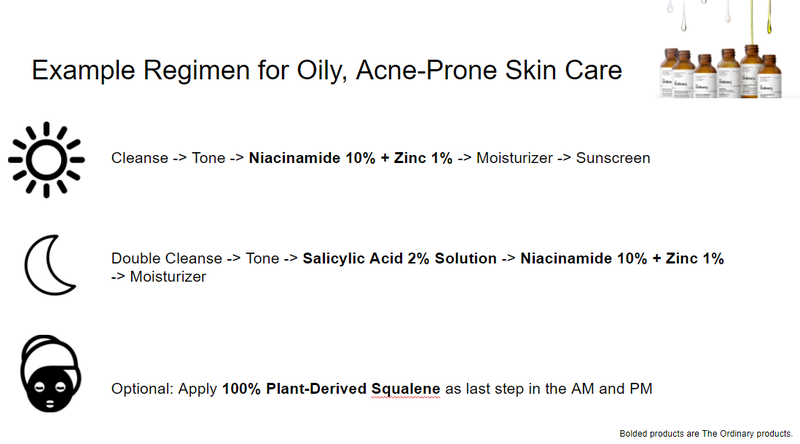 So let’s first differentiate the difference between oily and acne-prone skin. Skin types classified as “oily” tends to have overactive pores that produce too much sebum, or skin oil. It’s important to understand that skin of all types naturally produce oil to keep skin healthy and prevent it from drying out. It’s when your skin produces too much oil due to factors such as genetics, environment, and hormone that leads to issues such as shiny skin, clogged pores, and acne. All skin types, whether oily, dry, or combination can be acne-prone if you don’t use the right products. It’s a common misconception that oily skin needs to be “dried out” and the oils eliminated. If your skin does not get the moisture it needs, it will think it’s dehydrated and actually produce even more oil to balance out what it thinks is dry skin. For the purposes of this video, I am including The Ordinary treatments suitable for oily skin, to help control oil, give skin the moisture and exfoliator it needs, as well as treatments suitable for breakouts. Please keep in mind that the treatments in The Ordinary’s range are suitable to treat occasional breakouts. For persistent acne treatment over a long period of time, it’s more suitable to find other brands that offer benzoyl peroxide as well. Active ingredients that work well for oily skin and occasional breakouts in The Ordinary’s range include: niacinamide, salicylic acid (also known as BHA), and non-comedogenic moisturizers, or moisturizes specifically developed to not clog pores. Let’s take a deeper look at these actives and what they do. Described as a “high strength vitamin and mineral blemish formula”, The Ordinary’s Niacinomide 10% + Zinc 1% can be used as treatment for occasional breakouts and blemishes. It will also help to reduce sebum (oil) production and has been shown to improve skin’s overall tone as well. It’s also important to note that this product should not be used in conjunction to Vitamin C formulas as it compromises the efficacy of certain Vitamin C treatments. You can use one during the day, and the other at nighttime however. *Personally, I have been using the Niacinomide myself for the past three weeks, and have found it helpful in treating the very occasional pimple that appear in my jaw/chin area. For persistent breakouts, you should consider using a stronger treatment, such as Salicylic Acid. The Ordinary offers a Salicylic Acid 2% Solution which is a BHA (beta hydroxy acid) that is a chemical exfoliant which helps to reduce the appearance of blemishes with continued use. My personal experience is that Salicylic Acid tends to try out my skin so I use these treatments very sparingly. Full disclosure, however, is that I do not have oily or acne prone skin, so I wouldn’t need to use these treatments on an ongoing basis anyway. After you use your nighttime moisturizer, The Ordinary suggests adding 100% Plant Derived Squalene into your routine for added moisturization benefits. This hydrator helps to lock in moisturization and keep your skin hydrated so that it balances out and calms your skin’s tendency to over-produce oil. Squalene is neither water or oil based and it is non-comedogenic so it is less likely to clog your pores and can be easily absorbed into the skin and is suitable for all skin types. *Personally, I use this after my nighttime moisturizer 2-3 times a week to help seal in the hydration. I do not find it “completely ungreasy” like The Ordinary’s website suggests and would liken the feel to an oil. If you do not like the feel of oils on your skin, you probably will not enjoy using Squalene much. Here is a cheat sheet for your shopping trip!